This Wednesday is going to be one for the record books. Not only are we seeing the release of Gerard Way’s sophomore comic series The True Live of the Fabulous Killjoys on Dark Horse Comics, but we also have not one, but three Scott Snyder books. Since one those books happen to be about a certain Man of Steel, it’s safe to say that many of you have already made your grabs and have gone home happy. But there is one book sneaking just under the radar this week and it’s definitely worth a grab. Horror master Steve Niles teams with Matt Santoro with the gorgeously sombre horror story entitled Breath of Bones: A Tale of the Golem. While the Dark Horse website has this effort billed as a Nazi-slaughtering-monster-romp, this debut issue is anything but. Instead we have a coming of age tale about a young boy and his grandfather dealing with the death of their family and village during the last days of WWII. When the Grandfather hears that the Nazi are preparing to march on his village, the Grandfather sells his soul to protect those around him. 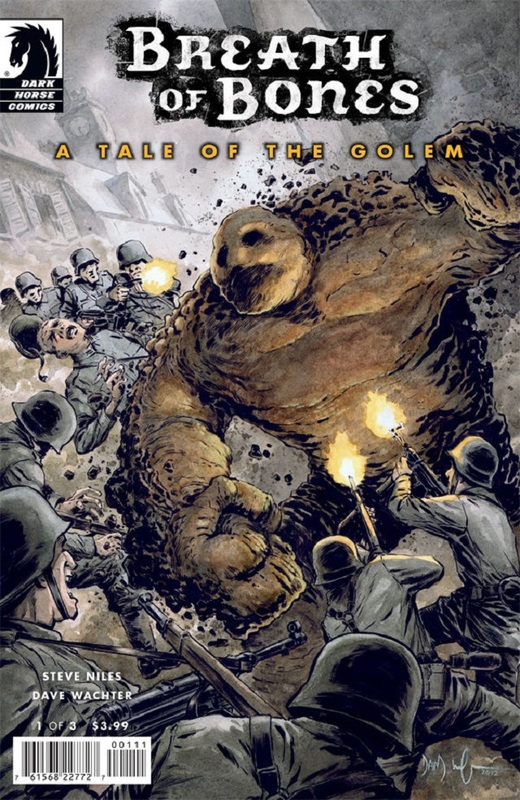 For those of you who are unfamiliar with Jewish folklore, a golem is a creature, born from mud and created by man. It is essentially a lifeless husk that will carry out the basic wishes of whoever controls it. This often results in negative repercussions for those involved with the golem. While we may not see the fully grown golem in this issue, the final shot of the little figure held in the small boy’s hands is powerful. Niles and Santoro have started us out with a beautifully told tale and like all good horror stories, this slow burn and serene setting help raise the tension enough to grab the reader right before the end of the issue. Dave Watcher’s beautiful black and white artwork really drives home the humanity at the heart of the story. If you took away the all the dialogue, you could tell the story from the look in the characters eyes. Something that is very hard to do. He even manages to change the entire tone of the book in a few simple pages, by ignoring regular panelling and shrouding each scene in a mysterious black swirl. Breath of Bones: A Tale of the Golem is going to be overlooked and shame on you for it. This is a horror story with tonnes of heart, topped with gorgeous black and white artwork. A sleeper hit in every sense of the word.